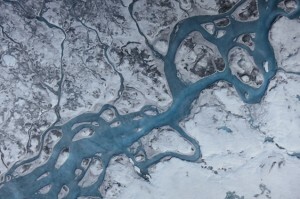 Satellite pictures show that the massive Greenland ice sheet is getting darker. Darker surfaces absorb more heat from the sun, hastening melt that contributes to global sea-level rise. 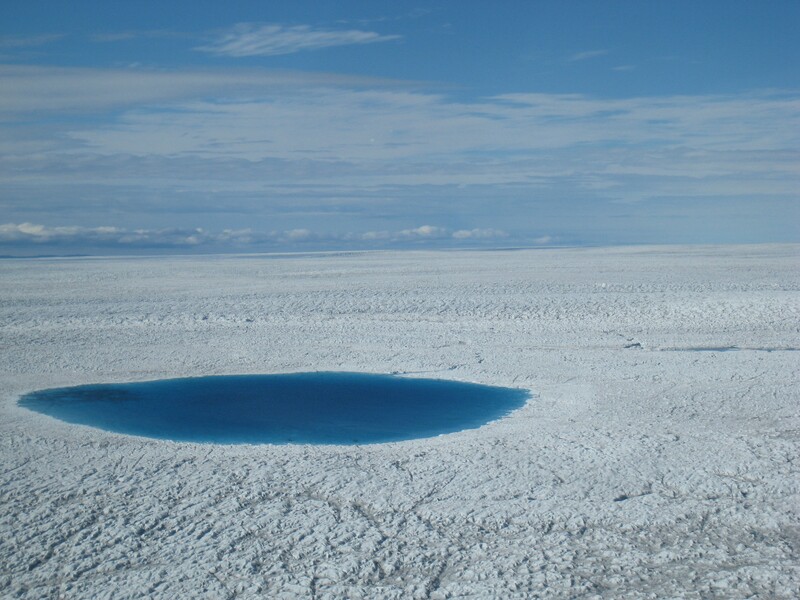 A University of Washington scientist is co-author on a new paper that tracks down why the ice sheet is darkening. The study, led by Columbia University, was published March 3 in The Cryosphere. Wildfires have been recently proposed as the cause for darkening of Greenland’s ice sheet, but historical records of fires during that period could not explain the changing reflectivity since the mid-90s, Doherty said. The authors find instead that most of the darkening is a side effect of warming. “The lion’s share of the darkening is driven by feedback to the snowpack optical properties,” Doherty said. 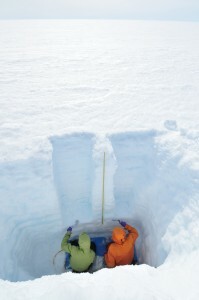 The study shows that as the glacier melts, the snow crystals get larger and impurities surface – both processes familiar to anybody who has seen old, spring snow. 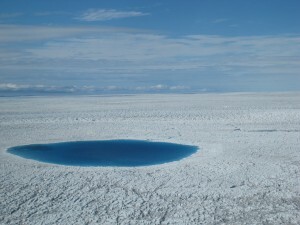 With warming each year’s snow melts completely to expose the darker glacier ice underneath, and there are more melt pools, which also darkens the surface. “You don’t necessarily have to have a ‘dirtier’ snowpack to make it dark,” said lead author Marco Tedesco, a research professor at Columbia University. Looking forward, the study concludes that continued warming will cause Greenland to absorb about 8 percent more sunlight by the end of this century, with bigger changes along its western edge. The research draws on the 2010 Arctic snow survey by Doherty and Stephen Warren, a UW professor of atmospheric sciences. The team collected some 1,200 snow samples from Northern landscapes, including Greenland. Their follow-up paper looked at how impurities tend to accumulate at the surface as the snow melts. By combining the on-the-ground observations with satellite images from 1981 to 2012 and computer models of glaciers, the new study shows the past two decades of darkening can be explained by larger crystals that reflect less sunlight and exposed impurities at the ice surface. The research also draws on Warren’s earlier studies of snow reflectivity and how air pollution affects polar landscapes. For Greenland today it appears that warming, not deposited air pollution, is the primary culprit. “Using satellites, models and other information to put some bounds on what is happening to the glacier’s surface and what’s causing it, our conclusion is that it’s not an increase in wildfires that is causing the darkening,” Doherty said. That distinction matters, she said, because it means that regulating particulate emissions from diesels or reducing wildfire smoke would not save Greenland’s ice. Instead, the darkening is being driven by increased melting, which is caused by climate warming. “There’s a potential for the Greenland ice sheet to contribute significantly to sea-level rise in the next 50 to 100 years,” Doherty said. When calculating future sea-level rise, she added, scientists need to be able to model all the processes that are significant. 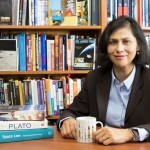 Other co-authors are Xavier Fettweis at Belgium’s University of Liege, Patrick Alexander at NASA’s Goddard Institute of Space Studies, Jeyavinoth Jeyaratnam at the City College of New York, and Julienne Stroeve at the University of Colorado. The research was funded by the National Science Foundation and NASA. 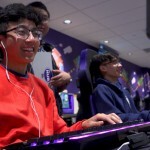 For more information, contact Doherty at 206-543-6674 or sdoherty@uw.edu. See also a Columbia University press release.